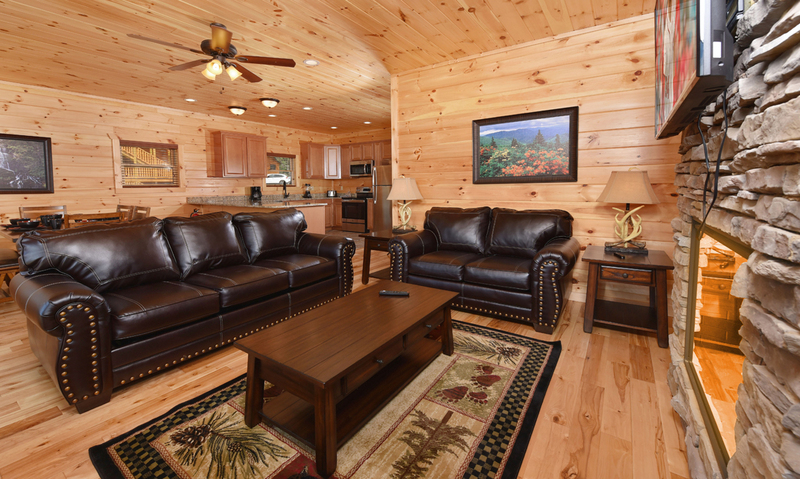 Ready for a fun family vacation, romantic couples’ weekend, or getaway with friends? 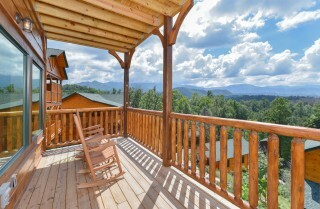 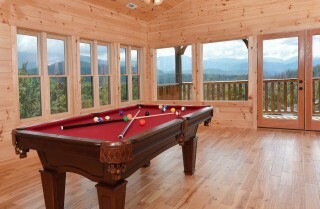 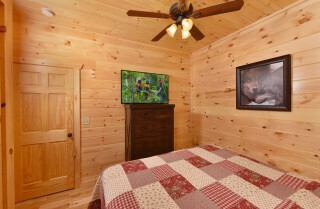 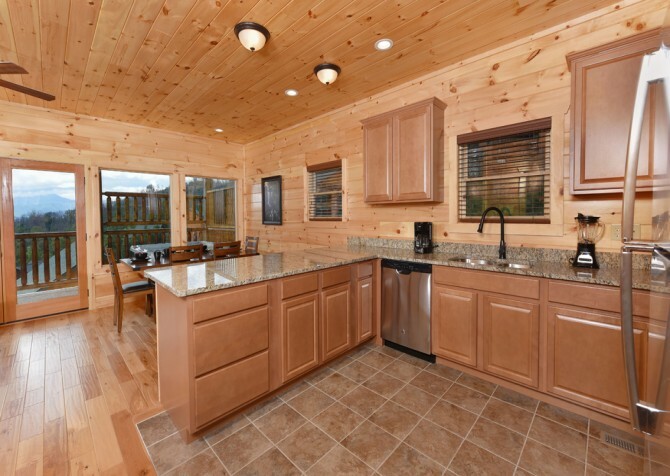 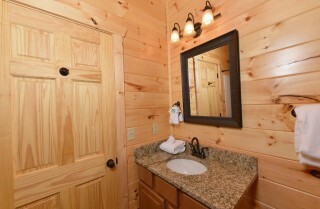 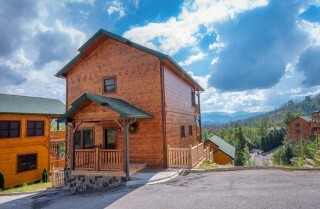 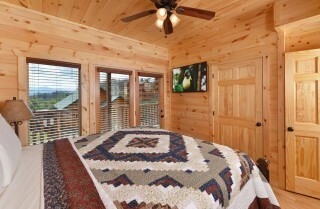 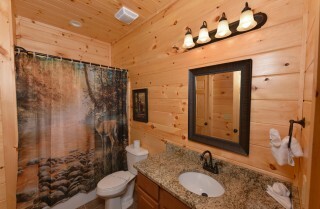 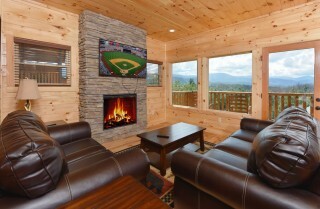 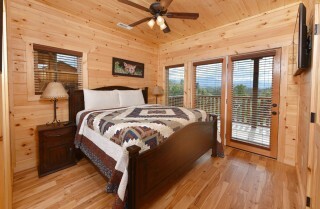 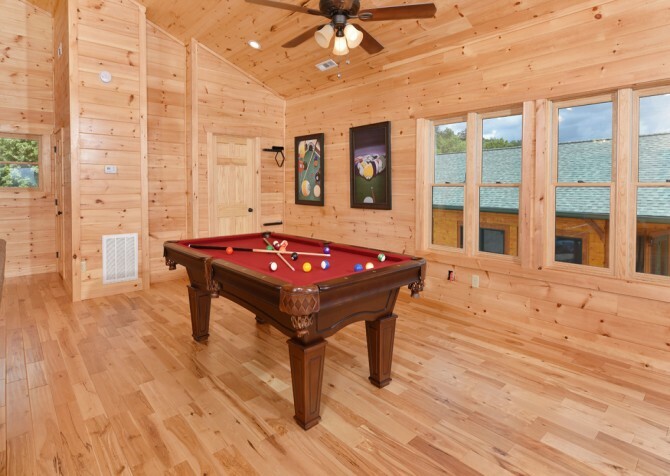 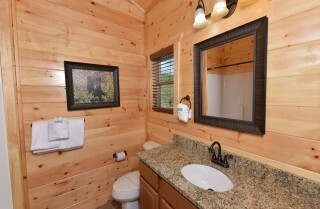 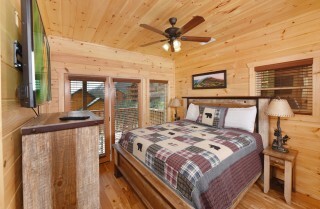 Check out Majestic View, a 4-bedroom, 4-bathroom cabin for 12 in the Gatlinburg Falls resort in Gatlinburg, TN. With almost 2,500 square feet of space, the cabin has room to relax, play, and spread out. Cozy up in king-size beds in the bedrooms, along with 2 queen sleepers for extra space. Mealtime is easy with the fully equipped kitchen in Majestic View, where you’ll find full-size appliances, dishes, glassware, utensils, and tools for whipping up snacks, dinners, and lunches in between fun attractions. 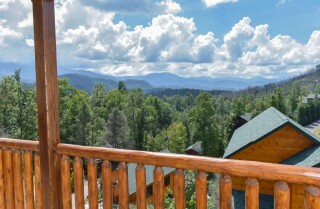 When you’re full, plop on the couch in front of the big screen TV and relax or grab a drink and sit back in the rocking chairs while enjoying mountain views. In winter, the electric (with heat) fireplace will make the living room feel extra cozy. 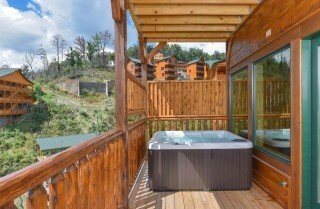 And a soothing new outdoor hot tub awaits when you’re ready to unwind before heading to bed. 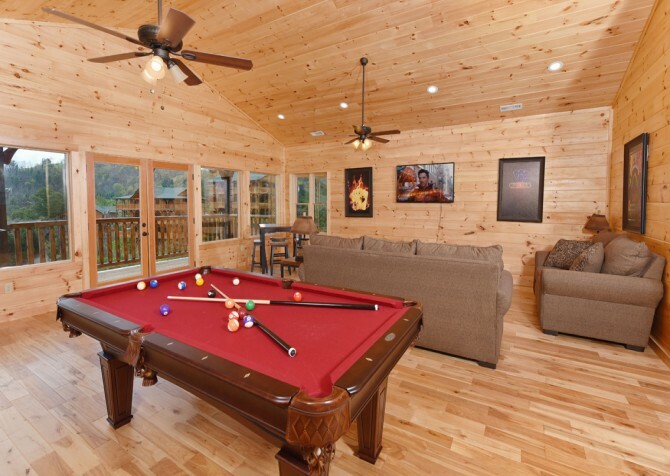 Want to keep everyone entertained during your stay in the Great Smoky Mountains? 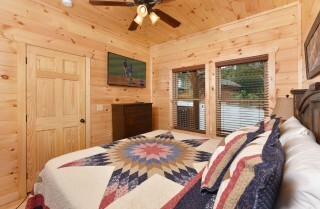 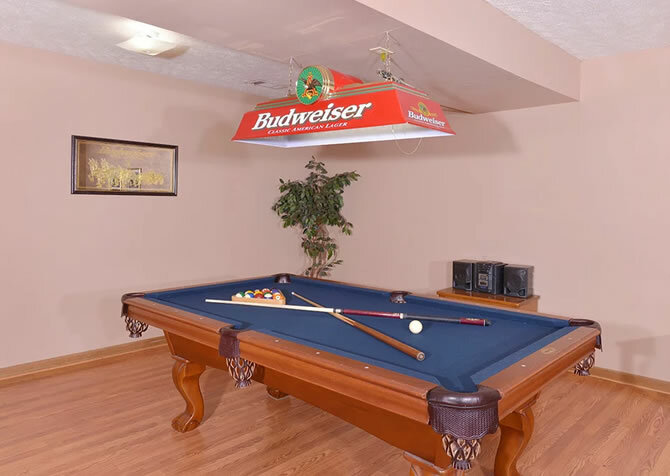 You’ll have new TVs in every bedroom, a big screen TV, and a pool table! 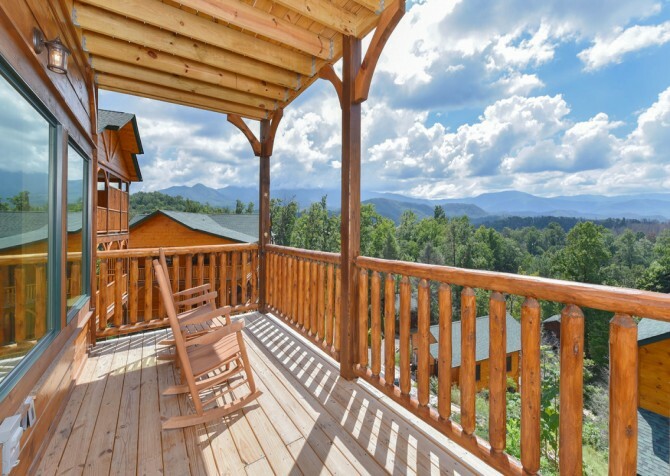 Of course, you can always take the flat, paved roads from the cabin to explore Gatlinburg and neighboring Pigeon Forge, too. There are plenty of restaurants, shops, and attractions to check out during your memorable cabin stay! As you step inside Majestic View, your eyes will be drawn to the wall of windows along the back wall, overlooking gorgeous mountain views you have to see to believe. 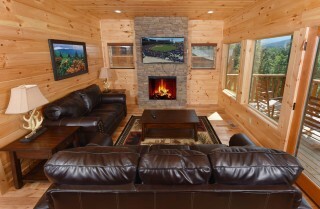 A great place to relax and view the rolling Smoky Mountains is the living room, featuring hardwood floors, a plump leather sofa with matching love seat, and a stacked-stone electric (heated) fireplace. 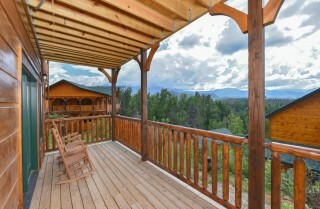 Drop your suitcases, prop up your feet, and soak in the majestic mountain peaks. 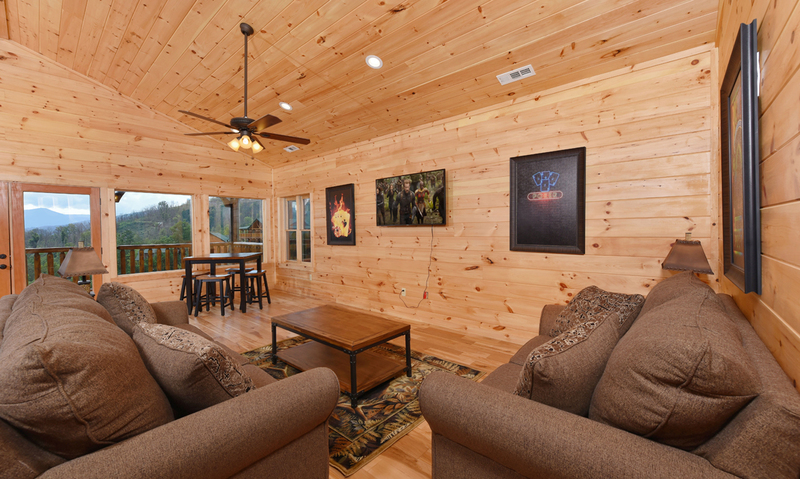 When the sun sets on a cool eve, get a fire going, brew a pot of joe, lay out a board game from home on the coffee table, and enjoy family night at the cabin. 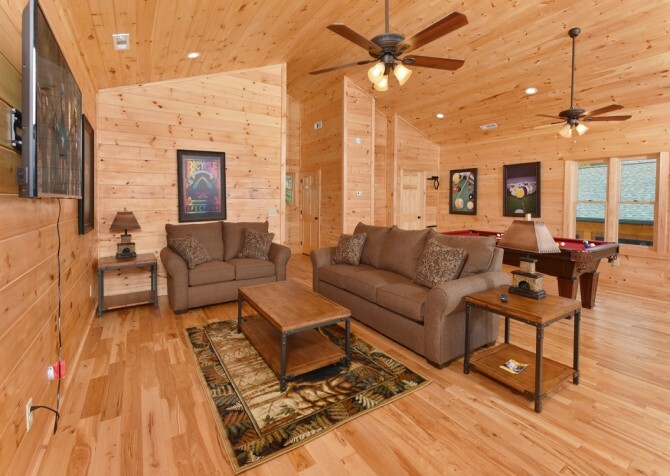 This space is also great for hosting movie nights on the big screen TV and taking a little time for yourself with a good book when everyone else heads to bed. 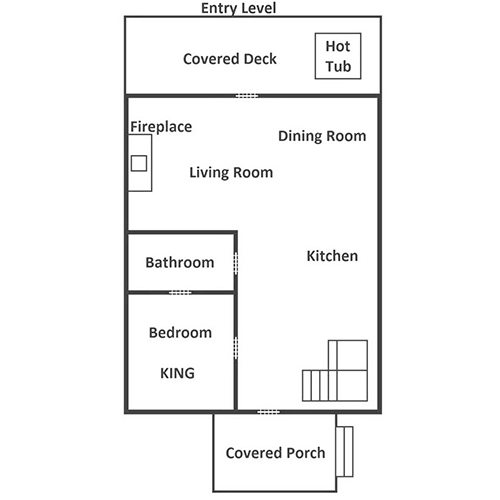 Hot breakfasts, yummy lunches, tasty dinners, and sinful desserts await in the fully equipped kitchen, complete with tiled flooring, stainless steel appliances, spacious countertops, and all the tools you’ll need to prepare and serve meals. Store beverages in the fridge, whip up fancy feasts on the stove, pop buttery delights in the microwave, and let the dishwasher clean up for you! 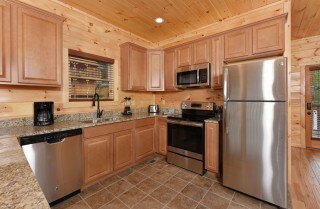 There’s also a breakfast bar for 4, perfect for keeping an eye on the kiddos or assembling a taste-testing crew. 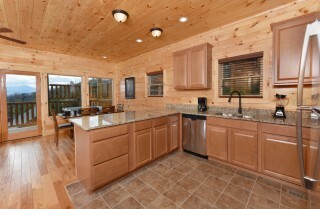 Just off the open-concept kitchen is the dining table with 4 cushioned chairs and a matching bench. 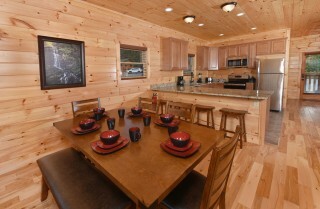 Set the table for family meals or enjoy lunch with your closest friends. This space also features breathtaking mountain views, making it perfect for sipping coffee in the mornings, planning trip activities, and laying out arts and crafts for the little ones. After you’ve enjoyed a tasty meal, head to the rec room upstairs for friendly or competitive rounds of pool. Or sit down at the pub table for 4 and knock back a few cold ones with your bestie and a card game. And if you’d prefer to relax, plop on the plush sofa or love seat and watch a little entertainment on the mounted flatscreen TV after playing board games (provided in the cabin). 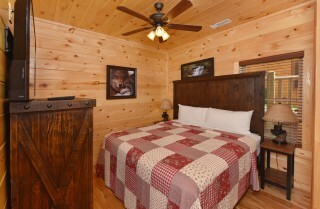 There are also 2 ceiling fans to keep everyone in optimal comfort. Oh, and don’t forget the top-notch mountain views, with direct access to the second-floor deck so you can take an even closer look. It’s the best spot at the cabin for selfies with the Smokies! Now that you’ve explored the Great Smoky Mountains National Park and played games for hours on end at the cabin, it’s time to drift to dreamland. 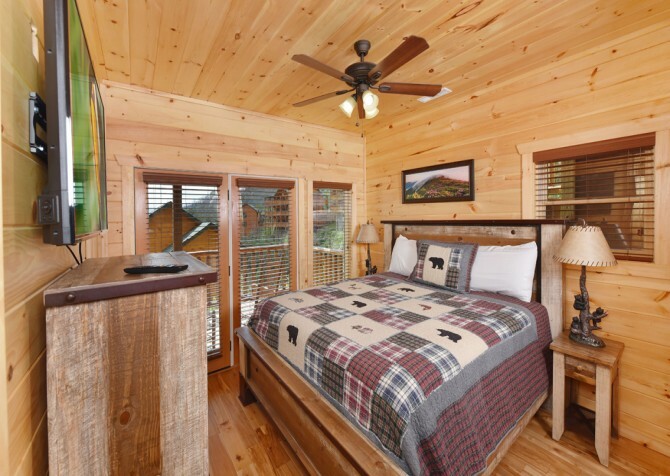 With 4 bedrooms — each with a king-size bed, stylish bedroom suit, ceiling fan, and a flatscreen TV — everyone will have a cozy place to unwind every night. Two of the bedrooms even offer direct deck access, meaning morning mountain views are never far away. 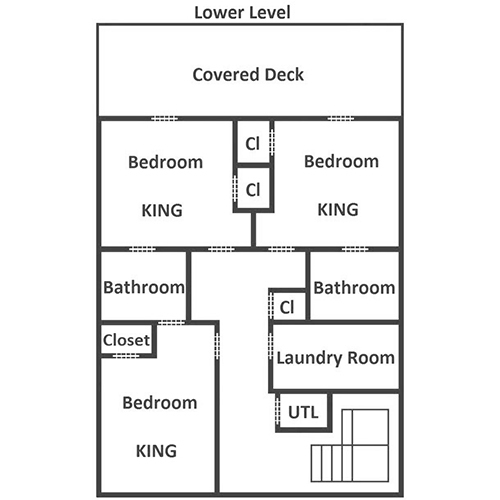 There are also 2 queen sleepers in the home to provide extra space for additional guests, bringing the maximum guest total to 12. 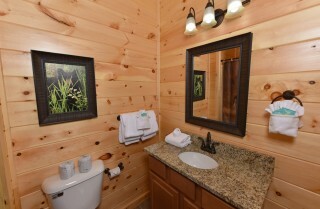 And when you have a full house to bring on vacation, you’ll truly appreciate the 4 full bathrooms at Majestic View! Pull up to the paved parking area for 2-3 vehicles at your vacation home in the Smokies, unpack the cars with ease with only 2 steps up to the front door, then explore the relaxing outdoor spaces at Majestic View. 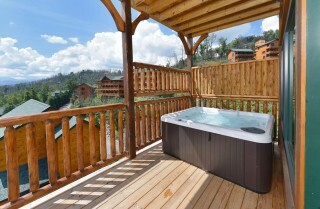 Chill in the rocking chairs with a cup of tea, admire stunning mountain views from multiple decks, and soak in the bubbly hot tub every evening. 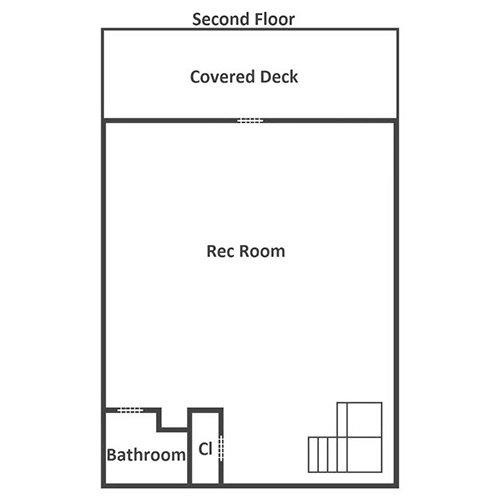 And don't forget about community pool access for fun summer days! Aside from the spacious interior, bonus amenities, and incredible mountain views, Majestic View also provides a handy washer and dryer, so you can pack light and make room in the cars for Smoky Mountain souvenirs. 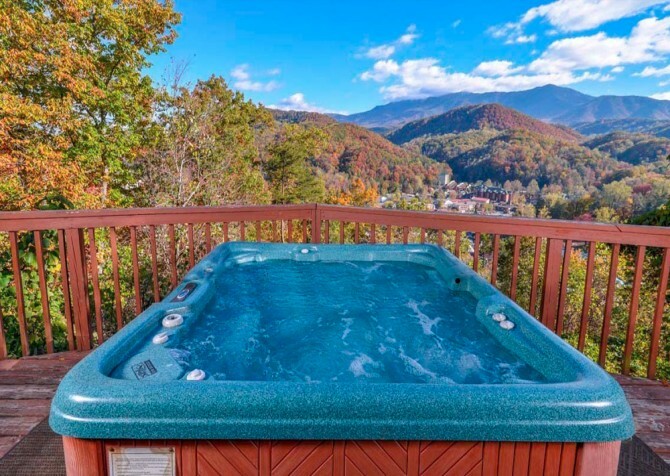 Less than 3 miles to the heart of Gatlinburg, Majestic View offers guests a convenient location to exciting attractions, tasty restaurants, quaint country shops, and more in-town fun! Head down the mountain, through the trees, and around sharp turns night or day up to 30+ miles per hour aboard the Gatlinburg Mountain Coaster. Spooks, haunts, scares, and screams await at the spine-tingling Mysterious Mansion, hiding treacherous creatures, lurking monsters, and your worst nightmares…all in the name of fun. 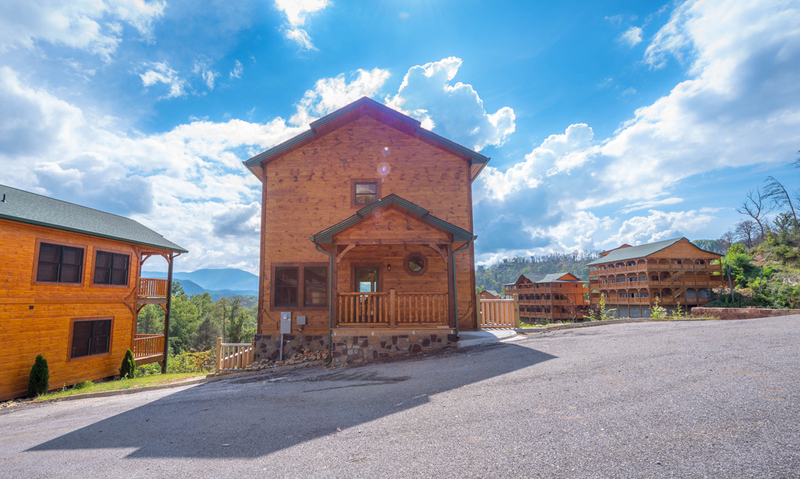 Ice skate year-round, snowboard and ski seasonally, meet adorable animals up close and personal, boogie on the area’s grandest dance floor, shop till you drop, and more at Ober Gatlinburg! 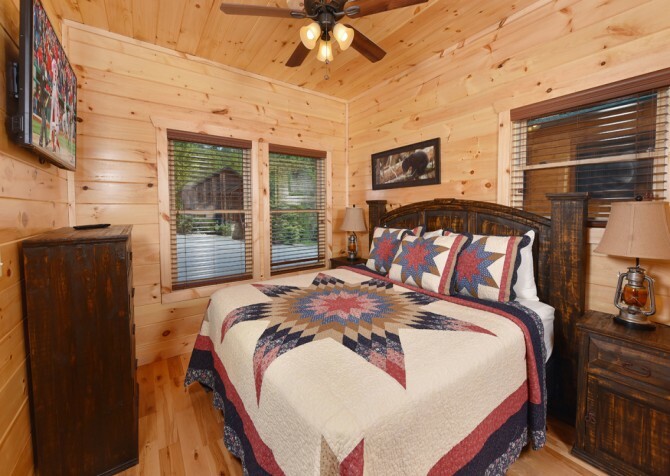 "Our cabin the Majestic View was everything it was beautiful everyone enjoyed their stay I would suggest the cabin to anyone and I would book it again everything was perfect ." Thank you so much for the great review! 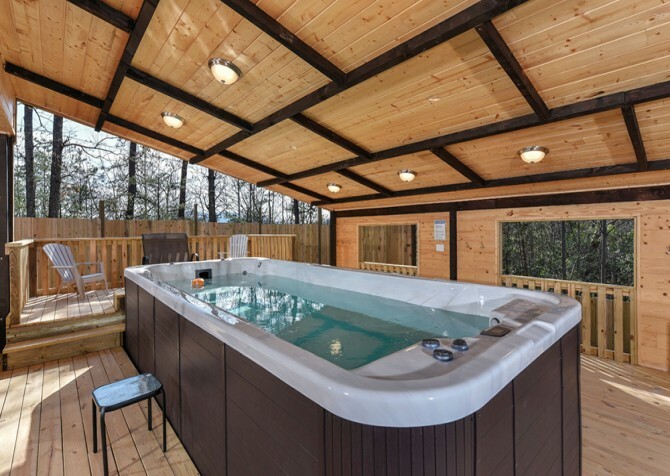 We are delighted to hear your group enjoyed Majestic View! 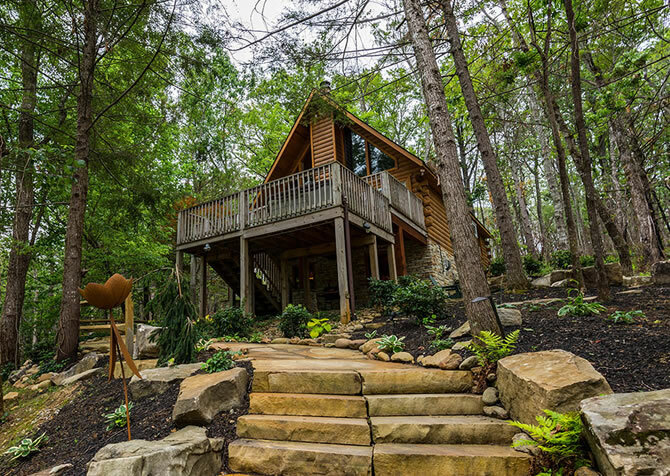 "Love Love Love this cabin! The huge windows with stunning views of the Great Smoky Mountains that greet you when you walk in cannot be described in words. This is the same view that you get from the well stocked game room, with a pool table, board games, and large TV. I wasn’t expecting the shuffleboard to be such a hit during our weekend getaway, but it really gave us a great place to hang out and sample some of the local moonshine (we did our own Moonshine Tour!). 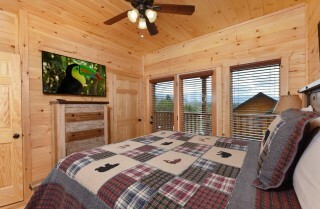 We had a variety of interests in our group, from the “vacation minded” (parents with young kids) to the amateur photographers. 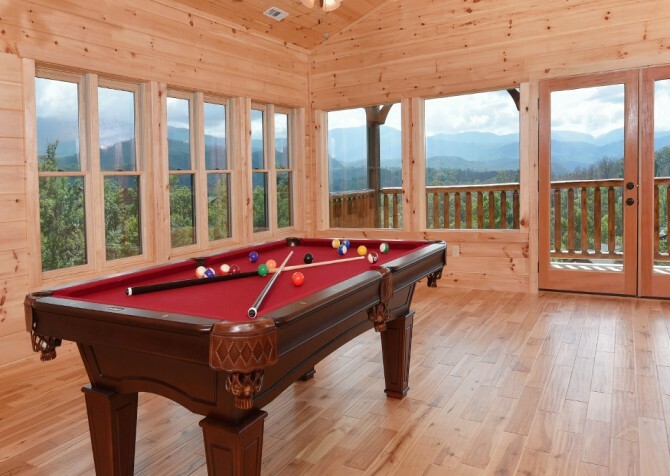 The parents loved spending time at the swimming pool, and the amateur photographers were shooting away from the balcony and throughout the Smokies during day trips. The parents took the kids to Dollywood while the others went on day hikes and explored the Smokies. 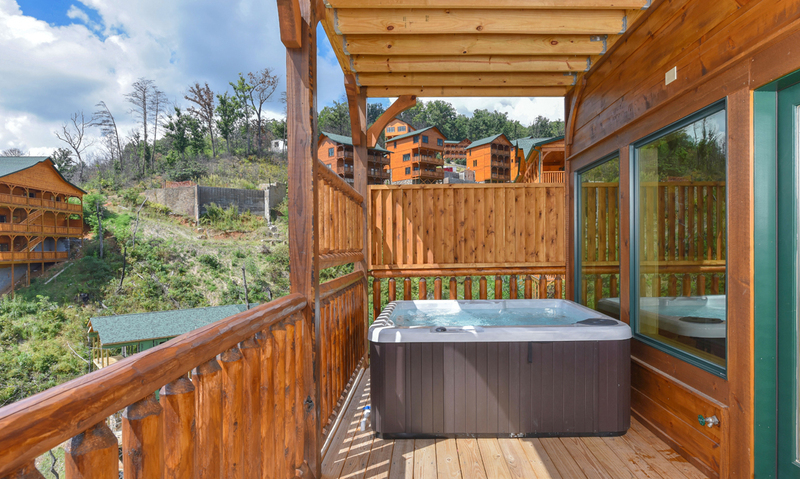 I was in the middle of the pack, spending my evenings in the hot tub on the deck overlooking the mountains and stellar views." Thank you so much for this raving review! We are so happy to hear that Majestic Views was the cabin of your groups' dreams! 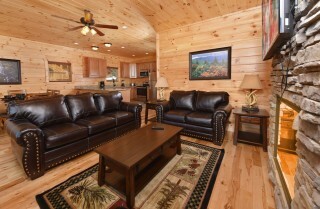 We hope to serve you and your group another memory filled trip soon!